A unique digital music box has been unveiled this week in the form of the XOXX Composer which consists of eight rotating discs that are used to control and create different sounds. Magnets can be attached to the discs at one of the 16 steps to trigger sounds via the companion application. Pitch and volume is controlled using the included sliders and knobs as well as a slider on the side of the system that comes complete with LED and controls the beats per minute. XOXX wants to simplify the language of rhythm by exposing how hidden digital functions like; sampling, looping and sequencing relate to mechanical functions and physical interaction. It is a plug and play hardware and desktop app that have been designed to let anyone create music from all kinds of genres, from raw industrial techno to groovy 80’s disco to dusty hip hop beats, by simply snapping magnets in place. 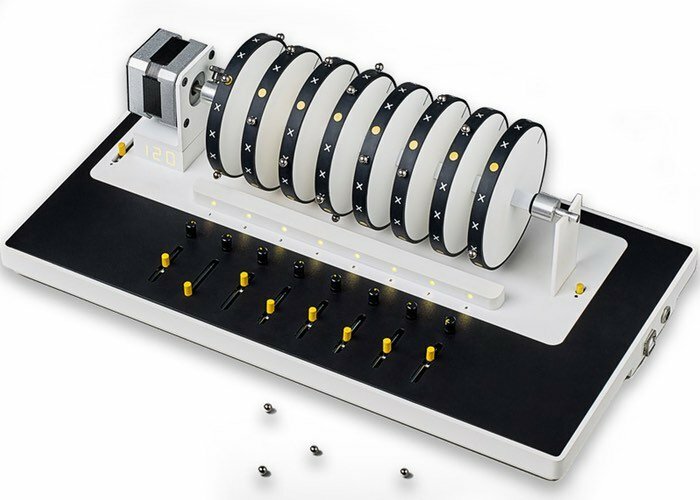 There are eight rotating discs meaning eight sound samples can be played dynamically with one another at the same time. Each disc is quantised into 16 steps for the possibility to create complex rhythmical patterns. Below each disc there is a physical interface for pitch tuning and volume output. XOXX is MIDI compatible and allows a wide variety of electronic musical instruments, computers and related devices to connect and communicate with it. Use XOXX with your favourite DAW or connect it to the dedicated XOXX desktop app. The app comes with an extensive sample library and it is easy to assign sounds to the discs. Here you can also monitor pitch tuning and volume output form your XOXX hardware. For more information on the new very unique XOXX Composer jump over to the official website for details by following the link below.